As "curators of delightful musical delicacies from every corner of the globe," The Just Desserts explore repertoire and rhythms from dozens of different countries, reinterpreting and sometimes re-envisioning any music that catches their attention. 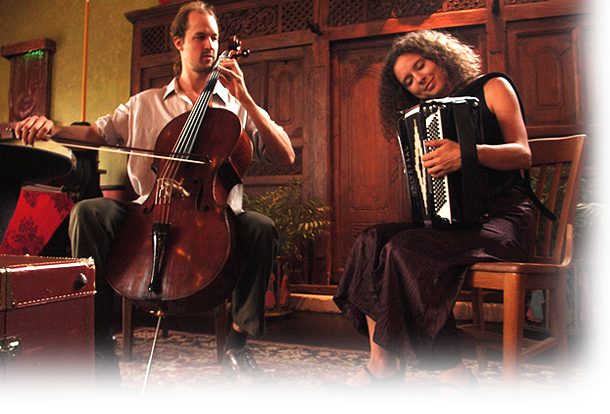 Centered around the unique pairing of accordion and cello, their always-evolving, deeply original sound includes elements of Latin, Balkan, tango, Americana, pan-European, western classical, Indian, Klezmer, jazz, blues, electronica, and Arabic music. Through a sophisticated and fun framing and blending of the essence of each individual musical tradition, the universality and diversity of the world's greatest music is made profoundly accessible to diverse audiences the world over. Formed in 2006, The Just Desserts was born of Lisa Shawley's and Michael Shay's shared passion for learning new musical forms. In addition to their classical training, Lisa's 15 years as a music therapist and Michael's 10 years as a music educator, songwriter, performer,cellist and producer laid the groundwork for The Just Desserts' mission statement: "To encourage exploration, expression, and inclusion through music and culture in the global community." Together their collective skills, experience and passion for the power of music as art and as a tool for bringing people together have led them to stages and spaces in eight countries. Since The Just Desserts' repertoire is drawn from traditional, classical, and popular music from all around the world, their performances are always informed by the international collaborators with whom they're currently playing and learning. Audiences are inspired by a deepened appreciation and curiosity about the music and culture of their own country and that of other countries around the world, thanks to Lisa and Michael's palpable passion for the same. And The Just Desserts make no apologies for their re-contextualization of the source material they draw from. To the contrary, the proposition that all music is alive, collectively shared, and constantly evolving presents the band and their audience with the opportunity to hear old things in new ways, and to celebrate rich traditions in an authentically connected global context.